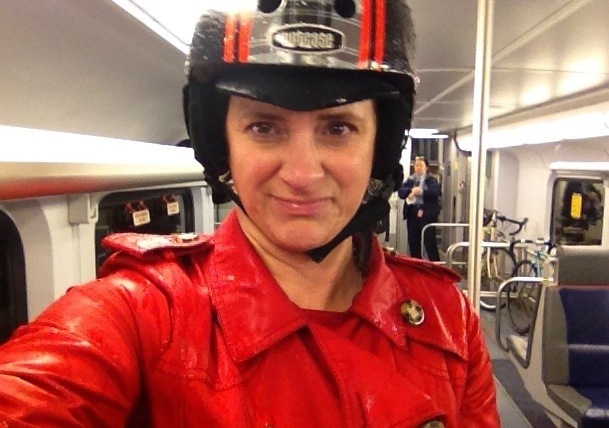 Bike Commute Diaries: Drowned Rat in 2 Min Flat | One woman. Many bicycles. The morning forecast said 70% chance of rain by 6 o’clock in the evening. But after a couple of false alarms with storms that fizzled more than drizzled, I grabbed my red trench coat instead of my rain burka. At 6 o’clock I walked out of the office. Pah, it wasn’t even sprinkling! I rolled down the trail with a little smile on my face. Just as I reached the train station, the sky opened up and rain poured down. My face tells the rest of the story. The coat works great in light rain, but this rain was out of control. But on the plus side, my dress underneath stayed dry and once I took off the coat you would never have known I had been in a rainstorm. For road and MTB rides, I’m also good in light to moderate rain as long as I stay moving and it’s not too cold. But once I stop moving it gets cold really fast. The worst was a day I got stuck in hail in summer gear on a descent down Mt Lassen.